Did you know that the first day of spring is tomorrow?? Yesterday, I was noticing that our grass is starting to green up. Yay! After being cooped up inside all winter with four very active toddlers, I find it encouraging to know that spring will inevitably have to show up one of these days! Let's welcome spring with a little giveaway, what do you say? I'm very excited to get to offer this giveaway because I just discovered Scentsy products myself! One day in January, Sean walked in the front door with a Scentsy warmer and a scent bar to surprise me. Having never had one before, my level of excitement was a bit subdued. And then, I plugged it in. And I was hooked. Scentsy warmers use low-wattage light bulbs to warm their wax. No flames! At our house, we have too many curious fingers to allow for open flames. I stopped burning candles once the kids were born because it was just too dangerous. With the light bulb method, the wax only warms to just above body temperature, so if little people spill it on themselves, it won't burn. And just for the record, yes, I did stick my hand in the melted wax on purpose just to see how hot it would get. The Scentsy fragrance wax is food grade which means that the scent is the only thing that evaporates as the wax melts. You aren't breathing in any wax burning chemicals. Each bar has eight squares and they are burned 1-2 at a time with each square lasting 10-24 hours. I generally turn my warmer on everyday during waking hours and switch out my scents every third day. It's so nice not to have to buy a 15 different candles to get different scents! And switching out the scents is easy! You just warm the wax, pour it out (into the trash or empty jar), wipe the warmer out with a paper towel and you are good to start using a different scent. It's so easy and brainless, I love it! I have several scents at this point and enjoy matching the scent to the weather or my mood. Sometimes I even use it to set the atmosphere of the house. Some of the scents that I have are Mochadoodle, Sweet Pea and Vanilla, Happy Go Lucky, Quiver, Enliven, and my current favorite, Luna. It's like decorating my house...invisibly. Ha! I'm excited to offer you a chance to win a fun Spring-Time Scentsy Set with everything you need to get your own Scentsy collection started. 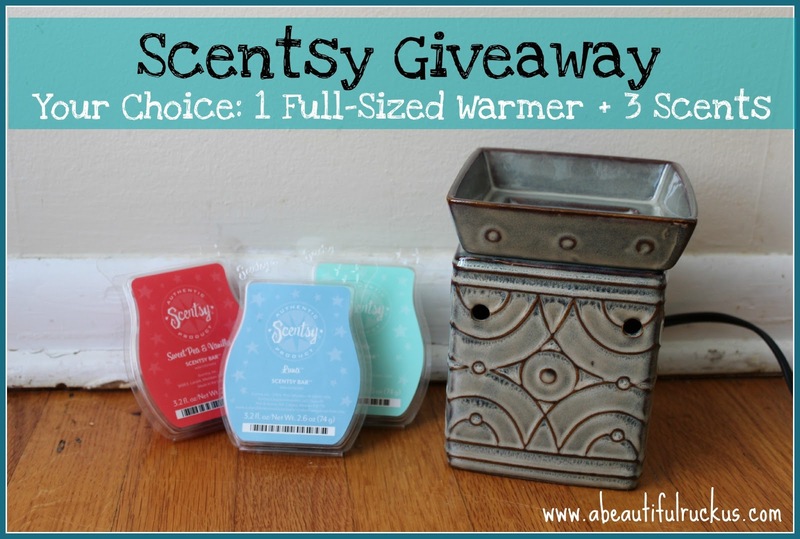 Janee Henderson, our giveaway sponsor, is offering one A Beautiful Ruckus reader their choice of One Full-Size Warmer and Three Scents! These are your choice so you can match the warmer to your personal home decor and the scents to your preferences. Please use the Rafflecopter giveaway below to enter. The first two tasks are not optional and must be completed to qualify for this giveaway. If you choose the "anonymous option" to comment, please at least include your first name and first letter of your last name. It's impossible to verify comment entries without names! The additional entry tasks are optional. Winning entries will be validated prior to announcing the winner with an alternate drawn if the entries cannot be verified. The contest ends at 11:59pm on Monday, March 25th. The winner randomly chosen and contacted by email on Tuesday, March 26th. The winner will have 48 hours to respond to the email with their information so that the prize can be forwarded to them. A Beautiful Ruckus is not responsible for the delivery of the prize and is not responsible if the sponsor does not deliver. This giveaway is open to residents of the United States. A Beautiful Ruckus received complimentary item(s) for review in exchange for hosting this giveaway from Janee Henderson, Scentsy Independent Consultant. I've always wanted to try Scentsy. :) My favorite warmer is the DoodleBud Scentsy Warmer. Cute and playful. I first discovered Scentsy at your house! Love it! I love the Doodle Bud warmer! I also like the Homestead one, but I think the Doodle Bud is my favorite! Oh man, it was so hard to pick just one scent, but I think I'd like to try A Wink & A Smile the most. I love the owl one, it is so pretty and cute!!! I like the Faith Warmer! I would like to try the baked apple pie scent! The Fizz Scentsy looks cute! Doodle Bud warmer is great. I love it. I like Lisbon - so pretty! The Charity Scentsy Warmer would be a beautiful adult or older child Easter gift. I'd like to try the lemon coconut and the mochadoodle... right now our favorite is cinnamon clove! The Route 66 Scentsy bar - plus it makes a great gift for a man. I like the Fizz Scentsy Warmer - so cute! In the den I love "welcome home" it is cozy and inviting as the name suggests! We only have one warmer plugged in in our bathroom. I love mine and would love to win! The My Dear Watson is my favorite! I love the Angora Warmer. I would like to try Baked Apple Pie! I love the Lisbon warmer! As for scent, I would love to try My Dear Watson. The description makes it sound awesome! The etched core silhouette is my favorite! it would be a perfect addition to the room when I do my massage work! I like the Charity full size warmer. I'd like to try the Havana Cabana Scent. I like the Roma one! I love Strata! Would be awesome in my home! I love the Fizz Scentsy Warmer.. So cute!! The Zingana Scentsy Warmer is my favorite. I love the Rustic Star warmer! I like the Zingana Scentsy Warmer! It's so pretty! I like the Strata Scentsy warmer. I really like the verdigris warmer. I'd really like to try the hello yellow scent! I love the Charity Scentsy Warmer! Thanks! I would love to try Coconut Lemongrass Scentsy Bar! I love the Zingana Scentsy Warmer! I love the Classic Satin Black Scentsy Warmer. This would be great for me, since I can't use candles in my apartment! I would have to decide between the Angora, Lisbon, and Doodle Bud warmers! I like the Whirlygig! Purple=awesome. Simply Rose, Cherry Limeade, Paradise Punch...they all sound so yummy. I have ALWAYS wanted to try Scentsy so bad and I have a feeling if I win I will end up being an addicted customer for life! I am obsessed with seasonal and holiday scents all year around to set an atmosphere for my home (most products are too "fumey" and smell toxic) I love how Scentsy sounds different (Plus I smelled the bars at local craft shows and art festivals and mmmmm!!! Thank you to blogger and sponsor for this giveaway opportunity! The Zebra Scentsy Warmer is my favorite! I'd really like to try the Cherry Vanilla scent! I like the Doodlebug warmer! Cherry Vanilla and Cucumber Lime! Black raspberry sounds so yummy! I like the Fizz warmer! Oh, how fun! I have been an admirer of the Scentsy products for quite a while already, but have never tried them. I would love to be able to though! Love the Fizz Scentsy warmer! Palette Scentsy Warmer is so perfect for my house! Jumpin' Jelly Bean Scentsy Bar is great for the season. I like the Roma warmer. I want to try A wink and a smile! Tamar Swe says : onyx full size warmer! I love buying from Janee but right now I have to say my favorite warmer would be the NCAA Texas Tech. I have my eye on that one. I like the crinkle full size warmer! I'd love to try Sugar Cookie! Cherry Vanilla, Vanilla Suede, & French Toast among others ..
Barrista is my favorite warmer... After the firefighter one. Turret Scentsy Warmer is my favorite. I like the elemental scentsy warmer premium! Beautiful! I like the Zebra warmer. Thank You! Kristy B.
Posy Peach sounds really nice. Thank you. Kristy B.
I would try Clean Breeze, but I'd definitely want to smell them all to see!! Thanks! -Rachel H.
I love the Angora warmer. Very pretty. A Wink & A Smile - that sounds cute and like a wonderful scent. I like the Onyx Warmer. The Lisbon is so pretty. I like the Lisbon Scentsy. my favorite is the DoodleBud Scentsy Warmer $30.00 it's so cute! i love the zebra warmer... and the coast guard one for my hubs! ive been hearing great things about the Posy Peach Scentsy, i need to try it! I like the Regal Scentsy Warmer PREMIUM. I would like to try the Simply Lime. Etched core silhouette and like to try cherry vanilla and hello yellow. I love the DoodleBud Scentsy Warmer! 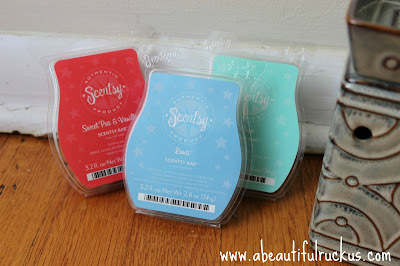 I've always wanted to try Scentsy but just havent had the chance! Thank you for the chance to win!! Cherry Vanilla is the one I would love to try. I love the palatte warmer....I haven't tried scentsy before so I could seriously have an issue. I have a thing for my house smelling great. I think I have tried every "air freshener" available. I am positive I will love this product. I just need to to figure out how to plug it in away from little hands. I would love to try the Clean Breeze scent! I like the Lisbon Scentsy Warmer.